This villa has been our Home from Home and as such there is everything that you will need in the villa. There is a cleaning service weekly if required, however the villa is cleaned after each family leave and left ready for the next family. The pool and gardens are cleaned/serviced weekly. The WiFi provides TV as well as internet connections, through the villa and a WiFi printer is provide so you can print out maps, boarding passes etc. Spent three weeks June/July 2018 in Casa Coleen and thoroughly enjoyed our stay. The villa was spotlessly clean and tidy and in a great location to get to the old town. There is a supermarket and bar/ restaurants a short 5 min. walk away. The pool was cleaned twice a week and the towels and bed linen weekly by cheerful and helpful staff. The owners, Peter & Agnis, are quick to respond to any questions and queries and the information provided by them prior to our holiday was great help getting the break off to a flying start. Definitely will be back and will not hesitate telling others about this little gem. Beautiful villa. Everything you could need and a fabulous location. Everyone was very helpful and welcoming. Have to say the photos don’t do the property justice. Very spacious and comfortable and we all had a brilliant time. Would definitely recommend to families. Thank you for a wonderful holiday! We have just spent 3 weeks in this villa. The villa is in a quiet residential street which is a 5 minute walk from the nearest shop/pub. We walked to the harbour/strip several times this can take 15mins or 40 mins depending on where you go. The villa was a good size although we thought the kitchen (needs more/updated utensils) and bathrooms were very tired and need updating we had trouble the last few days trying to use the shower in the bathroom as the tap would not ajust to shower we did try to contact the management company but the number was not 'assigned'. The outside space was brilliant lots of space and sitting areas the pool was lovely and warm. There was a lovely view from the roof terrace all in all this was a very good holiday for us all. Peter & Agnes were very helpful with the information supplied. We stayed at the villa in October 2014 and had a wonderful 2 week stay. The location is excellent and within easy walking distance of lovely restaurants and the Marina. 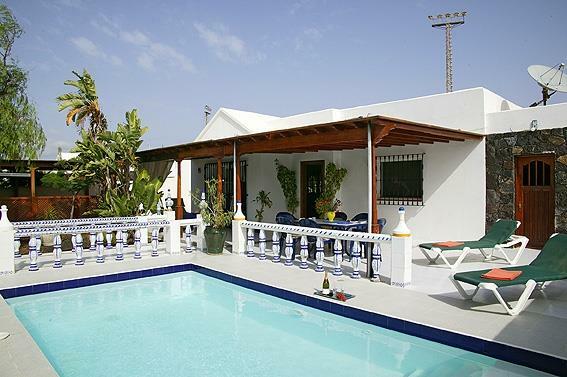 The villa is in a quiet street, it has a heated pool and was spacious and lovely. An excellent little supermarket was a short walk away as was the friendly Marios restaurant. We would recommend it as a perfect base to enjoy a relaxing holiday.